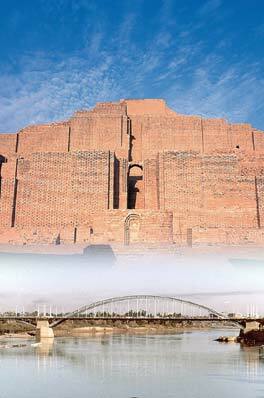 As one of the most ancient cities, Ahwaz was called Oxeen as found in historical manuscripts. It was also called Hormoz Shahr during Sassanians when it developed into their capital and the center of Suziana (Khoozestan today). The city is thoroughly hot and humid in summer, sometimes over 48° , but favorably mild during fall and winter. Karoon, the only navigable river in Iran, passes through the city. the mausoleum of Ali-ebn-e-Mehrayar; the ruins of Achaemenian dam; the ruins of Jondi Shapoor; the ruins of Susa; Haft Tappeh and above all the enchanting temple of Choghazanbil (1250 BC).